Egypt's 81 + million population, the most among the Arab nations, lives concentrated in cities, towns, and villages along the Nile River. It has been nearly 18 months now, since Egypt's revolution and the new slogan, "Arab Spring" emerged. Following closely on Tunisia's popular uprising, Egypt's initial resistance was youth dominated and included the strong presence of women. The huge street protests eventually resulted in the crumbling of support for Hosni Mubarak, the strong man ruler of the country for over 30 years. While Mubarak sat in prison awaiting trial on charges of murder stemming from putting down street protests (plus corruption charges and a number of others), a series of elections promised by the military, were held. A new parliament was elected, dominated by Islamists, most strikingly the Muslim Brotherhood which had been banned under Mubarak and whose ideology raises concerns across the Western world. And now, one of two candidates stand ready to take on the formal reins of power in the next few weeks. The formalities of the trial of former President Mubarak, as well as a cohort of relatives and close allies. 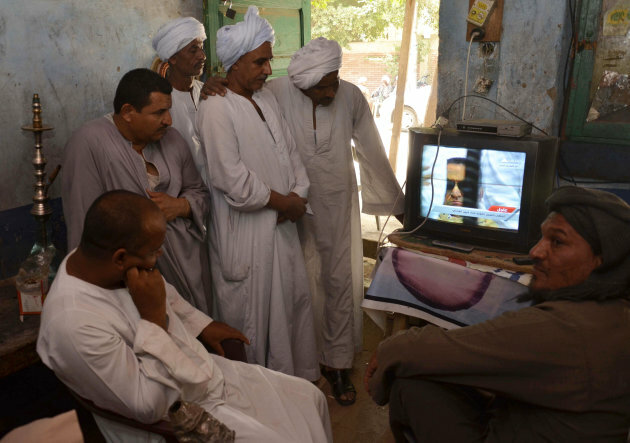 Egyptians in their common dress, watched the trial unfolding on TV. Last week, the trial of Hosni Mubarak and associates concluded. The verdicts were mixed, pleasing very few it seems. 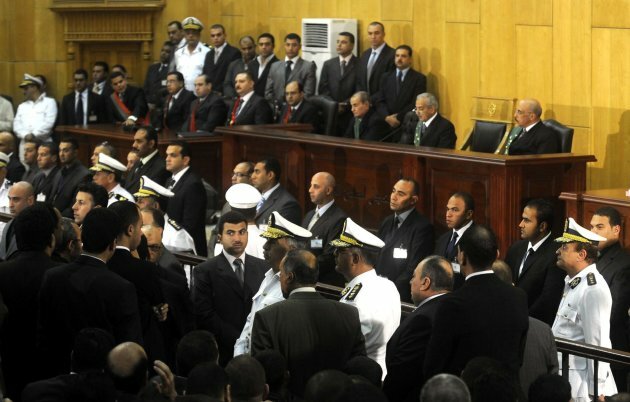 Mubarak was sentenced to life in prison, some police officers were acquitted. One Mubarak son was sentenced to time already served, etc. And a variety of street protests began again - not a bad thing in itself as before the population had little opportunity to express itself. Others used the occasion to protest against continued military rule. This man holds a placard with script made of spent bullet cartridges "Down with Military Rule"
Some, looking ahead, protested against Mubarak's former Prime Minister Ahmed Shafiq being one of the final two presidential candidates. Indeed, one of the mysteries of the presidential election is that one of the two runoff candidates is actually Mubarak's former Prime Minister. Who is supporting this man with enough votes to challenge the other candidate, Muslim Brotherhood leader Mohamed Morsi? Regardless, voting for Egypt's President is scheduled to begin June 16, and the odds on favorite is an Islamist. The next President of Egypt is one of these two men. Ahmed Shafiq, left, or Mahmoud Morsi, right. A Canadian Free Press article summarizes it this way, "Now Islamists make up a majority in the Egyptian Parliament. Their presidential candidate, Mahmoud Morsi, is an Islamist. The opposition candidate, Ahmed Shafiq, is from the old regime, a military member and a Mubarak look-alike. Corrupted elections fraught with bribes – votes traded for oil, rice and potatoes—brought them about. All are advocates of Islamic Sharia law, a state religious system having nothing in common with democratic principles, now making the outcome for the people of Egypt a grim reality." Why so grim an assessment? The world will find out soon what leadership the Muslim Brotherhood is likely to bring. However, one of the darker aspects of this past week's protests was another attack on Friday by a mob of Egyptian men on a group of women who were attempting to highlight rampant sexism in Egyptian culture. The women were groped and beaten, with reports of some being sexually assaulted. An ugly statement - some saying it was a clear message that women would have little social space in the upcoming society beyond that of home. Egyptian women definitely do NOT have any safer or broader space in Egypt's new democracy. An AP story describes the situation this way, "Sexual harassment of women, including against those who wear the Islamic headscarf or even cover their face, is common in the streets of Cairo. A 2008 report by the Egyptian Center for Women's Rights says two-thirds of women in Egypt experienced sexual harassment on a daily basis. A string of mass assaults on women in 2006 during the Muslim feast following the holy month of Ramadan prompted police to increase the number of patrols to combat it but legislation providing punishment was never passed. After Friday's attack, many were already calling for another, much larger stand in the square against such assaults. Another participant in Friday's march, Ahmed Hawary, said a close female friend of his was attacked by a mob of men in Tahrir Square in January. She was rushed off in an ambulance, which was the only way to get her out, he said. After suffering from a nervous breakdown, she left Cairo altogether to work elsewhere in Egypt. "Women activists are at the core of the revolution," Hawary said. "They are the courage of this movement. If you break them, you break the spirit of the revolution. For a little more on one of the candidates, Ahmed Shafiq, read the story at this link. The report hints at two points. A reference that there was much more support for Mubarak than is generally acknowledged (and therefore that quiet network has been behind Shafiq's surge). A general unease over the implications of an Islamist government, especially one supported by the Muslim Brotherhood.